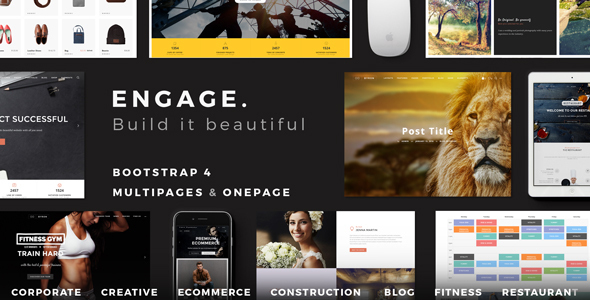 Engage is a creative and powerful multipurpose template perfect for blogging or showcase products & services. It include multi-Page & Onepage layouts. Engage is a professional an clean theme, adapted for almost all type of business and project: blog, agency, ecommerce, construction, fitness, restaurant, portfolio, wedding… Build a beautiful website using a theme made by experienced designers. Theme include 40+ homepages & onepages demo layouts, and more are coming soon. If you have specific concept you are looking for that is not yet included in theme, don’t hesitate to send us a message to discuss about it. Once you purchased Engage template, you will be entitled to free download of all future updates. Images presented in theme are for the demo purpose only and are not allowed for personal or commercial usage. You can buy them on Shutterstock to use for your purposes. - Update: html page with revolution slider now work without local or online server.